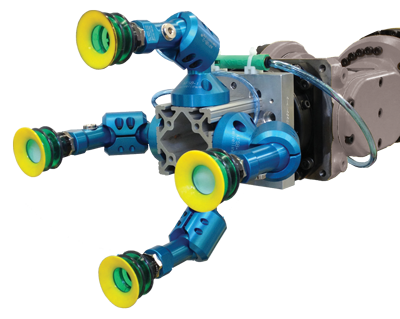 Swivellink is the highly adaptable mounting hardware that will simply and securely mount precision equipment in industrial environments including robot end-effectors. Whether you need an emergency stop button, operation indicator lighting or an interface monitor to be raised for optimum ergonomic utility, or you have a vision system that would work best if it could be mounted further out over your conveyor line, Swivellink has the hardware that will hold your equipment precisely in place, wherever you want it to be. Choices include using a single- or duel-arm to mount either cameras or lights. Swivellink has mounting kits that fit equipment from all major industrial vision system manufacturers, each available in hundreds of configurations. Positioning of operation indicating lights for maximum visibility has never been easier. The mounting kit for any monitor with the industry standard VESE mount platform makes placing your factory floor monitors in their optimum position a snap. Any robot’s functionality in your factory will be determined by its ability to pick up the parts you need to modify, mount, or manufacture. Using vacuum to lift has never been easier than with Swivellink’s ball, socket and knuckle system. Just place your robot in a normal, known, pick-position, adjust the EOAT to fit the part you need to move, place the vacuum cups where you want to grip, and tighten the knuckles to lock the cups in position. Swivellink solutions like this work with centralized and decentralized vacuum solutions. Swivellink’s standard product series allows you to select solutions to your common mounting needs. 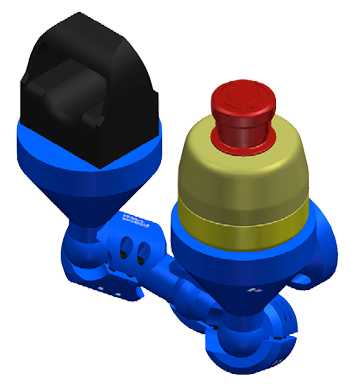 The ball and socket design allows for 3-dimensional positioning and mounting. Knuckles provide an extreme range of motion while maintaining the internal through feed capability without pinching a cable. Four socket head cap screws securely lock the position. It really is that simple; just combine bases, knuckles, and links to fit your exacting requirement. HTE is your Swivellink mounting system selection, sales and implementation resource if you are located in Kansas, Missouri, and Illinois.